“Mom” at Tiny Green Mom is excited to announce that The Winner of the Donsuemor Valentine Cookies Giveaway is Stephanie V! We hope that you enjoy these light, delicious cookies with your family this Valentine’s Day! Thanks to everyone who entered this eco-fabulous giveaway! Donsuemor Cute Cakes are adorable bite-sized mini cakes — little treats with big flavors. Inspired by the marriage of cupcakes and petits fours, Cute Cakes are delightful, yummy and fun to eat. They make the perfect base for these delicious Hugs and Kisses Cute Cakes for Valentine’s Day – an activity the entire family will enjoy! In a small saucepan, melt the butter and water together over medium heat. Remove from the heat and allow the mixture to cool slightly. Add the powdered sugar, whisking vigorously until smooth and thickened, about two minutes. Allow the icing to stand and thicken until it is a spreadable consistency. With an icing spatula, spread icing on the top of each cute cake. Using a scissors, cut the licorice laces to create 6 X’s and 6 O’s. Place each on one of the cute cakes. Serve. A variation of the recipe above can be to top each cute cake with a chocolate heart standing in the frosting to create Cupid Cakes. How do I love thee? Let me count the ways! Show the love of your life how much you love them with these elegant, tempting Heart Shaped Madeleines from Donsuemor! An elegant gift box is packaged with a variety of chocolate and vanilla madeleines, hand-dipped in chocolate or white chocolate coating, which are sure to delight your sweetheart! Made from all-natural ingredients, Donsuemor Traditional Madeleines are soft, moist, and baked with pure butter, eggs, and vanilla. They are a lovely accompaniment to coffee, tea, or a tall glass of organic milk! 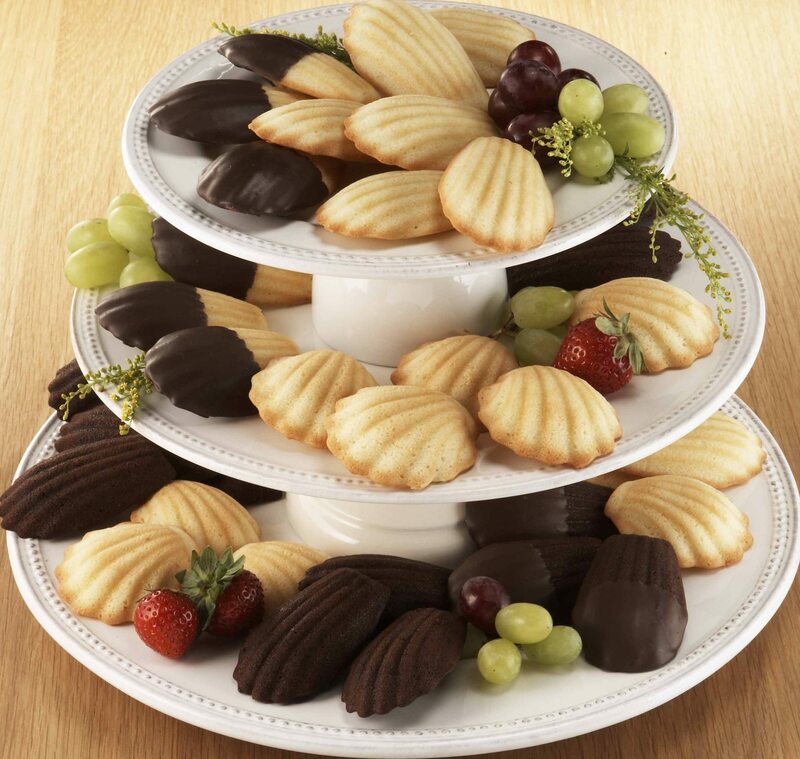 Placed on a serving platter, the Madeleines or Cute Cakes make a stunning display at any soiree, as well! Donsuemor offers a tempting selection of gift sets, all at an affordable price for any special occasion. Visit www.donsuemor.com to learn more, or to order something sweet for you or your loved ones. Enter to win a sample pack of heart-shaped Donsuemor Cookies, just in time to give to your sweetheart this Valentine’s Day! These light, delicious Gourmet French Madeleine Cookies will melt anyone’s heart! From January 14th – January 21st, you can enter to win daily on Tiny Green Mom! First, leave a comment below to let us know why you would love to win a sample pack of Donsuemor Cookies this Valentine’s Day. Subscribe to Tiny Green Mom by email to receive a “Fresh Post” daily. Leave a comment below to let us know that you subscribed. This will be verified. Leave a comment on another Tiny Green Mom post. Leave a comment below with the name of the post you commented on. “Like” Donsuemor on Facebook. Please leave a comment below along with your Facebook name to let us know that you have done so. Follow Donsuemor on Twitter. Leave a comment with your Twitter name to let us know that this has been done. This is only valid for one entry. Blog about this giveaway. 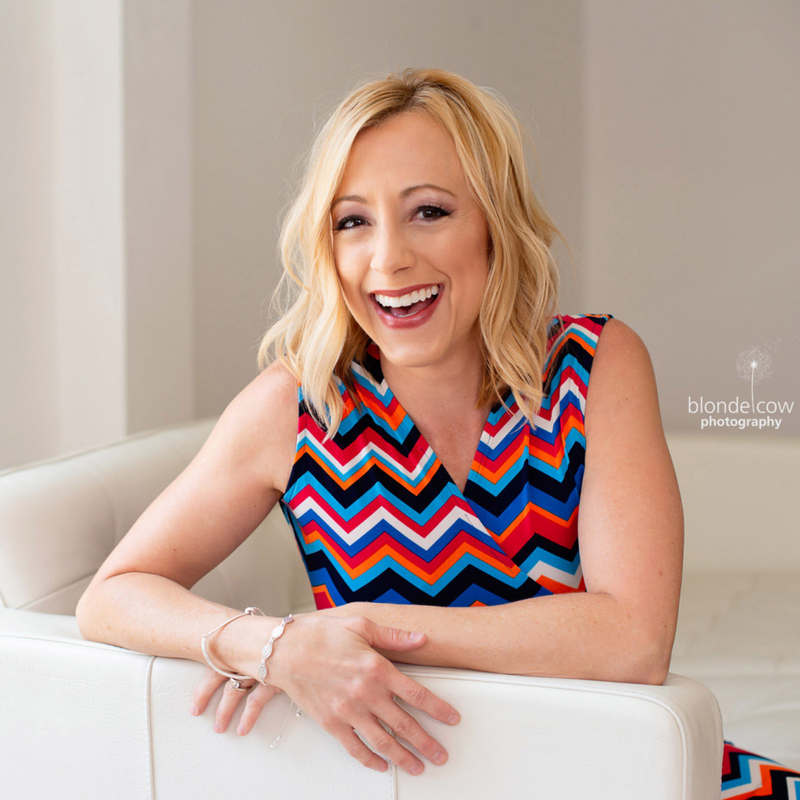 You must have a link to this giveaway in your blog post. Please leave a comment with the link to your blog post. The Donsuemor Valentine Cookies Giveaway ends on January 21st, 2011 and is open to the US and Canada only. Please leave your email address in each comment, and make sure to leave a separate comment for every each and every entry that you make so that they will count for you! The Winner of the Donsuemor Cookies Giveaway! Oh boy, is someone in for a treat! Congratulations to Maureen on winning Donsuemor Cookies through this giveaway! A special thank-you to everyone for participating! http://tinygreenmom.com/wp-content/uploads/2018/07/logo-sm.png 0 0 Tiny Green Mom http://tinygreenmom.com/wp-content/uploads/2018/07/logo-sm.png Tiny Green Mom2010-11-21 05:00:402010-11-19 20:31:37The Winner of the Donsuemor Cookies Giveaway! Enter to win a sample pack of Donsuemor Cookies, just in time for holiday entertaining! These light, delicious Gourmet French Madeleine Cookies and Cute Cakes make a lovely display on a dessert table or are perfect for serving with a cup of coffee, tea, or hot chocolate. From November 15th – November 19th, you can enter to win daily on Tiny Green Mom! First, leave a comment below to let us know why you would love to win a sample pack of Donsuemor Cookies. Subscribe to Tiny Green Mom by email to receive a “Fresh Post” daily. Leave me a comment below to let us know that you subscribed. This will be verified. The Donsuemor Cookies Giveaway ends on November 19, 2010 at 12 midnight and is open to the US and Canada only. Please leave your email address in each comment, and make sure to leave a separate comment for every each and every entry that you make so that they will count for you! Become a fan of Donsuemor on Facebook. Please leave a comment below along with your facebook name to let us know that you have become a fan. The Donsuemor Cookies Giveaway ends on November 19, 2010 and is open to the US and Canada only. Please leave your email address in each comment, and make sure to leave a separate comment for every each and every entry that you make so that they will count for you! 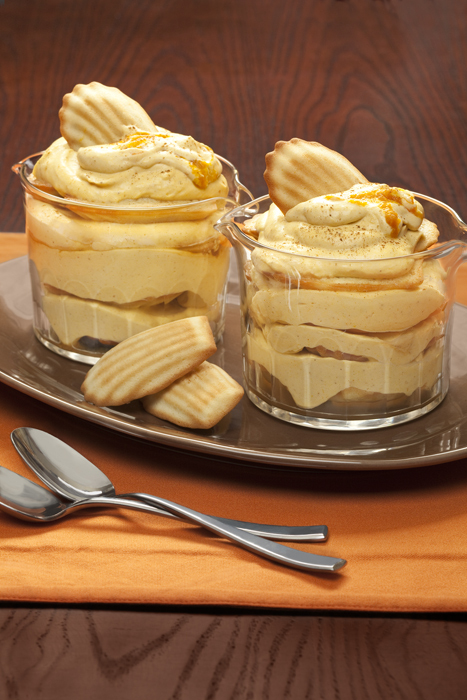 Here’s a fabulous holiday twist to a favorite dessert – tiramisu! With the added pumpkin and spices such as cinnamon, cloves, and nutmeg, this is a lovely dessert to serve this time of year! In a chilled metal bowl, beat whipped cream and sugar until soft peaks form. Add mascarpone, cheese, pumpkin and spices. Beat until smooth. Lay two madeleines in the bottom of individual bowls or glasses. Evenly distribute two tablespoons of rum between the individual bowls, sprinkling on to the madeleines . Spoon over half of the filling. Repeat. Serve with more whipped cream, if desired.